While our Almond Green Tea delivers a straightforward marzipan scent, Almond Spice radiates with clove and cinnamon-like cassia, citrusy, floral bergamot and natural almond essential oil. The warm, comforting aroma becomes wholly satisfying. This golden soap is flecked with tender calendula petals. Sweet almond oil superfats the bar for a luxurious moisturizing lather that leaves your skin soft and smooth. Let this bar scent your dresser drawers and linen closets. Delight your friends with Almond Spice in your guest bath. Take time yourself to relax and enjoy the soap in a lavish bath. 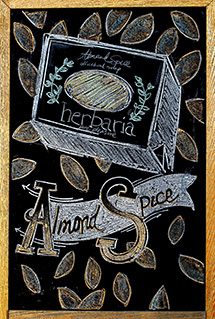 A year-round favorite especially appreciated during the winter holidays, Almond Spice brings joy any day. It makes a lovely hostess gift. Here’s a scent that appeals to men and women.